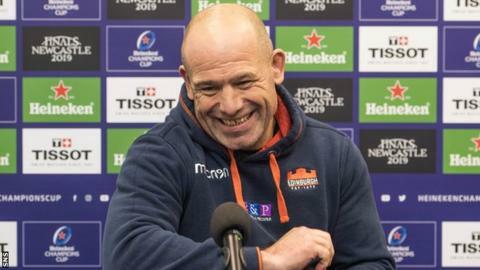 Edinburgh coach Richard Cockerill hopes to beat Montpellier to seal a Champions Cup home quarter-final - and also help out "little brother" Glasgow Warriors. A victory for Cockerill's Pool 2 leaders on Friday would secure Warriors' progress into the last eight as one of the three best runners-up. It would be the first time both sides have been in the quarter-finals. "It's about time we started doing them some favours. We will try and get them qualified," Cockerill said. "We are playing for big stakes here, we are playing for a home quarter-final, we are playing to qualify. "We are only interested in Edinburgh, but the by-product is getting Glasgow through. "If we win, we get us through and Glasgow through, so come and support Scottish rugby. "But come and support Edinburgh. We have got something worth supporting." Glasgow fans have every reason to back Edinburgh against Montpellier, who are second top in their group, as the capital side aim for a seventh win in succession. A home win would guarantee Warriors a place in the last eight before they travel to face their own pool leaders, Saracens, on Saturday. "We are a small nation, we've got a small playing pool, so for us to even be contemplating getting a quarter of the European knockouts to be Scottish is pretty impressive," Cockerill added.